We provide a friendly healthcare service dedicated to the highest standards of care and professionalism for you as an individual. Osteopathy is a system of clinical practice that looks at the individual from a mechanical point of view, it emphasises the importance of the musculoskeletal system to the overall health of the individual. Osteopaths believe that the musculoskeletal system contains all the elements to restore health if properly stimulated through various manual techniques, correcting problems in the body’s structure and providing an environment for the body to heal itself. Back pain is a very common problem, with reports suggesting as many as eight out of ten of us will suffer from it at some point during our lives. Around 5.6 million working days in the UK are lost each year due to back pain, second only to stress. Neck pain is common in people of all ages and is often caused by how we use our necks. Working all day bent over a computer, driving long distances, poor posture while standing or sitting, stress and tiredness can all cause neck pain. There are several reasons for headaches. Most are not serious and once the cause is established headaches can often be helped by simple changes in lifestyle. One cause can be tension or strain in the muscles and joints of the neck and upper back. Arthritis is a common condition which causes pain, swelling and inflammation and often stiffness in the joints of the body. Sciatica is an umbrella term used to describe leg pain, much like lumbago is an umbrella term used to describe low back pain. The nature of most sports involve explosive stop, starts intertwined is a lot of twists and turns. This inherently leads to the possibility of injury whether that be traumatic or repetitive. Welcome to Leek Deansgate Osteopaths from the practice principal Scott McGrath. We aim to provide professional osteopathic healthcare in a modern, relaxed and friendly environment. 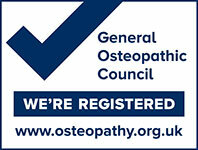 All our osteopaths are fully qualified and registered with most major insurance companies. We also attend regular continuing professional development courses to allow us to stay registered with The General Osteopathic Council, so you can be assured you will receive the most up to date osteopathic treatment.